Imagine spending a week with Marilyn Monroe in London during the 50’s. That’s precisely what we do in this delicious film, based on the published diary of Colin Clark. Clark, played with just the right touch by Eddie Redmayne, had the chance to work with Sir Laurence Olivier as a third assistant director on his film “The Prince and The Showgirl”, which stars none other than Marilyn Monroe (an excellent Michelle Williams). Colin is as mesmerized as everyone else when Monroe first arrives on set, but that appeal is quickly extinguished for many of the cast and crew (especially Olivier), as it becomes clear that Marilyn is highly unstable, unreliable, and generally difficult to work with. Colin, however, still admires the actress, no matter how damaged she is. As luck would have it, he even becomes her close friend and supporter during this difficult period. But as Marilyn’s manager, Milton Greene (Dominic Cooper), warns the young man at one point: “That’s what she does, she breaks hearts. She’ll break yours”. Michelle Williams may look nothing like the real Marilyn Monroe, but in her posture and speech patterns, she’s damn near perfect, and that’s what elevates “My Week With Marilyn” above your average memoir film. In the moments where Marilyn isn’t in front of the cameras, we begin to wonder what really went on behind this pretty face. Whether it was depression, sadness, manipulation or perhaps a combination of all these things, we’re not really sure. And the movie doesn’t really answer those questions. Marilyn ultimately leaves the set on the final day leaving as much questions as answers. And that’s the mystery at the center of “My Week With Marilyn”, which succeeds in being credible on every level. It’s also a chance for Williams to prove once again that she is one of the finest actresses out there. 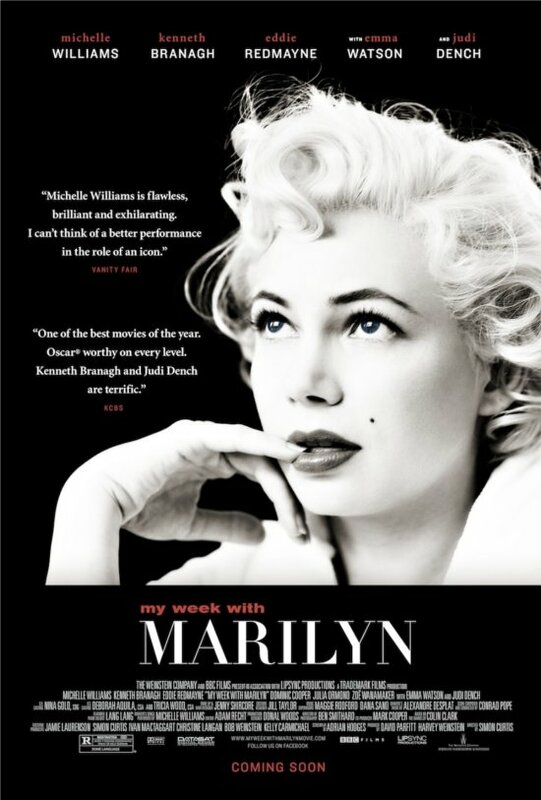 “My Week With Marilyn” isn’t original in any way, but it couldn’t be more enjoyable, like reading a delightful showbiz magazine filled with behind the scenes gossip. Michelle Williams deserves all the praise she’s been receiving, because without her, the movie wouldn’t exist. She convinces us that she is that pretty, complicated, sad icon we’ve all read so much about, and makes us want to know even more. Isn’t that awesome?